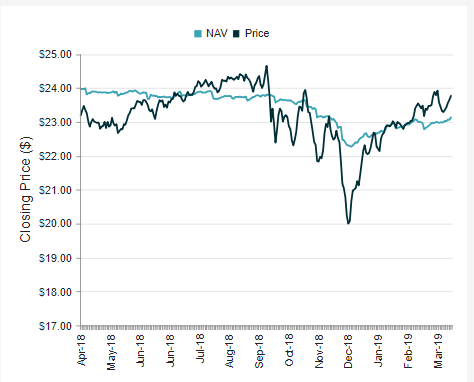 PDI and PCI continue to do OK on a NAV basis, but are now close to fully valued on a price basis. The Fed pivot towards a dovish tilt means the shifts in these portfolios away from interest rate swaps was the correct move. Non-agency MBS is also a declining percentage of the total portfolio meaning that the drivers of past returns are changing. PIMCO Dynamic Credit and Mortgage (PCI) and PIMCO Dynamic Income (PDI) still remain at the center of our Core Portfolio- as they have for the last 3.5 years. The "PIMCO twins" have done extremely well on a risk-adjusted basis but there are changes afoot and we thought we'd go through some of them with our members. The main thesis has been relatively unchanged for most of these last three years- that these vehicles housed boatloads of non-agency mortgage backed securities purchased at just the right time. One of the things closed-end fund (CEF) investors often fail to recognize is the initial date of new fund launches. These can be well-timed by fund sponsors providing a competitive advantage against the rest of the sector and create a great opportunity for investors. That thesis may be shifting- not radically- but slowly over time. In the last year, they've been moving away from that bread and butter investment. While it still represents the largest sector in the portfolio, the size of it is declining in terms of market value. We will run through why this is and what it potentially means for investors. Despite a -2.2% decline in non-agency debt in the fourth quarter, the sub-sector finished 2018 with a +3.3% gain surpassing the broader credit markets. New issuance continues to trend higher yoy but did fall off in the fourth quarter. The new issuance market has been largely dormant since the Financial Crisis but has, in the last couple of years, shown signs of life. In the table below, you can see private label mortgages (the ingredients for non-agency MBS) constituted over one-third of the entire market in 2007. Shortly thereafter, the space was largely gone until last year when it doubled from 4% to 8%. The decline in the fourth quarter for non-agency MBS stems from the widening spreads realized across most credit sectors. Recall in our previous writings that the market lumps non-agency MBS in with high yield bonds, something we highly disagree with at this point in the cycle. Our rationale is that ten years following the Financial Crisis where subprime mortgages cratered, these borrowers continue to make their payment. These formerly busted MBS' that are now "re-performing loans" meaning that either the borrower started making payments again or the loan was restructured so that they could afford the payments, continue to be a main driver of PIMCOs strategy since 2010. However, in the last several months, the percentage of the portfolio devoted to non-agency continues to fall. In the last quarterly update (December 31), PCI had just over 50% in non-agency debt. That is down significantly from early last year when the fund held over 70% in the sector. Instead, high yield and non-USD EM credit is now approximately one-third of the portfolio. The fund has also reduced their interest rate swap exposure increasing the duration of the fund. This not entirely surprising given PIMCOs notion that the 10-year bonds have hit their highest yields of the cycle. They do still have several hedges on the short-end of the curve and are long "the belly". PCI and PDI are not outperforming the multisector space like they normally do. The main drivers of that are the lack of a significant rally in non-agency MBS compared to other sectors of the market and the relative differences of funds in that sector. 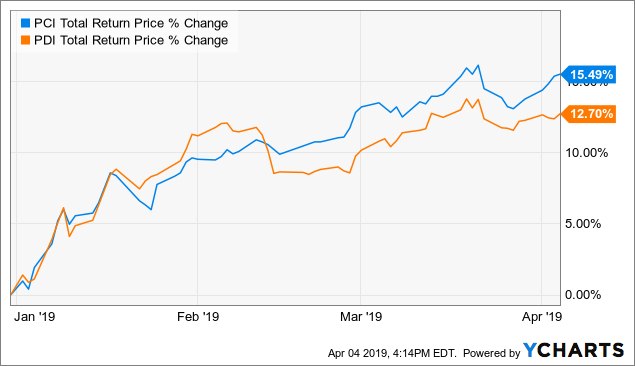 For instance, PGP, despite the significant drop it has taken recently, continues to be the top performer mainly because it is really an equity index. Franklin Universal Trust (FT) is a fund that has over one-third of the portfolio in stocks. So you do have to be careful comparing funds in this particular sector. In the chart below, you can see the darker line completely collapse in mid-to-late December because of those factors. Of course the NAV was also down (partially) due to those same factors listed above. In our Flexible Portfolio, we essentially used up all cash to go massively overweight the position. Thus, the YTD price returns are up low-to-mid teens easily besting the S&P 500. That is fantastic performance for a bond fund. Since then, we have taken off the overweight and moved back to our target weight in the Core Portfolio. With PCI at a +2.7% premium and PDI at a +15.3% premium, the funds are very close to fully valued. We have not added to either of the funds in the last three months and continue to hold at levels slightly above their target weights. We are happy to continue to collect the 8.5% income stream and wait for the next market hiccup to re-add the overweight position. Many investors think the shares are overvalued but we would disagree. One of the reasons would be that they are still a couple of points off the 52-week highs in terms of premium. In addition, z-scores are positive but no where near the +2 levels that would initiate a cause for caution. Lastly, the new Federal Reserve's dovish tilts means that interest rates will remain lower, leverage costs are no longer the severe factor they were, and CEF structures earnings 8%-9% are now more attractive warranting a higher valuation. One of the most common questions we receive from members is whether we think PCI or PDI will cut their distributions in the near-term. Right now, we see nothing that would cause us concern about the sustainability of the payment. PCI and PDIs distribution payment have been the same since October 2015. In the interim, they have paid significant cash payments in the form of year-end special distributions. Coverage levels for both funds fell off in the last few months, albeit from very high levels. PCI was at 192% in December but it declined to 89.2% in February. PDI was at 85% in December and is now sitting at 76% as of February. We will be getting March figures in about two weeks time which should shed some significant light on trends. UNII levels are still nicely positive with PCI at +22 cents and PDI at 10 cents. PHK, PGP, and RCS, all of which cut their distributions on April 1st, all have negative UNII values of -12 cents, -12 cents, and -21 cents*. In addition, and this is the key, all three of these funds have issued 19a notices for most of the last two years. If PCI and PDI were likely to cut, we would likely have to see many months of 19a notices come out. We think the distributions are safe for several more months at the least. The reduction in the level of non-agency MBS is not a large concern for us. PIMCO is known for putting the best ideas into these vehicles that they can find because they get the most bang for their buck. Sticking a small position into PIMCO Income, their large open-end mutual fund, won't have any effect simply because of its massive size. One thing to consider is that most banks and hedge funds have been unloading these securities as they've closed the gap to par. With the selloff in high yield securities and only the small decline in non-agency MBS debt during the same period, perhaps they took some of that position off to re-allocate towards high yield. In any event, with these funds there's a lot of trust in PIMCO management. You're largely investing in a black box. Well maybe not completely black but definitely obscured. When you do that, you just have to study the NAV, assess the valuation, and compare to what else is in the market today. Most bond CEFs have recovered mightily since the start of the year so there aren't many other cheap options where you can earn 7.5%-plus yields with some upside optionality to boot. For now, we are holding on to our position and collecting the income stream- though as we noted earlier, we did take off the significant overweight we had on PCI. Another market hiccup will surely come. Until then, we have some dry powder sitting in open-end funds and even some cash that is on the sidelines ready to be deployed. One of the hardest things an investor can do is buy when the market and these funds are selling off strongly. Our Yield Hunting marketplace service is currently offering, for a limited time only, free trials. Our member community is fairly unique focused primarily on constructing portfolios geared towards income. 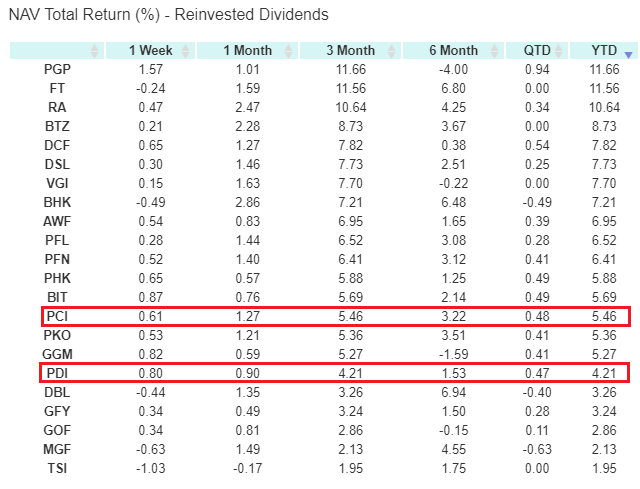 The Core Income Portfolio currently yields over 8% comprised of closed-end funds. If you are interested in learning about closed-end funds and want guidance on generating income, check out our service today. Check out our Five-Star member reviews. Disclosure: I am/we are long PCI, PDI. I wrote this article myself, and it expresses my own opinions. I am not receiving compensation for it (other than from Seeking Alpha). I have no business relationship with any company whose stock is mentioned in this article.